Lakeland’s Premier Facility for Events of Higher Altitude! The SUN ‘n FUN Expo Campus provides the best venues to host your private event and is a truly unique space for your special day or night. Planning a corporate event for your company? Producing a national fundraiser for your non-profit organization? Looking for a new home for your much-anticipated annual festival? Searching for the perfect place to have your dream wedding? SUN ‘n FUN is the answer to all of these questions. With both indoor and outdoor facilities, SUN ‘n FUN is the ultimate venue rental location for virtually any event imaginable. We pride ourselves on being a rather unique venue. Originally created by a small group of dedicated aviation enthusiasts to introduce visitors to the wonderful world of flight while also enhancing its future. The SUN ‘n FUN Convention Campus is currently surrounded by almost usable 200 acres. 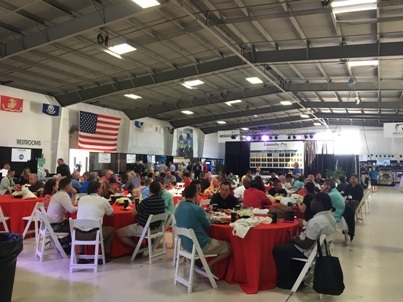 Our annual event, The SUN ‘n FUN International Fly-in & Expo, is the second largest event of its kind in the world and the largest annual convention in the state of Florida. SUN n’ FUN may seem like an unusual choice for an event, but that unique aspect is also what makes it so original and unforgettable. WHAT QUESTIONS SHOULD YOU ASK PRIOR TO BOOKING? How far in advance should I reserve/book the venue? What does the venue cost? Who can decorate the venue? What setup operations will SUN ‘n FUN provide for my event? WHAT INFORMATION DO I NEED TO PROVIDE PRIOR TO BOOKING? Will you require food and beverage? How did you find us? For example, did you attend an event at our facility? Did a friend refer you? Were you searching for “event venues”, “party venues” or “banquet halls near me” online? These questions are important things to consider when choosing a venue. Once addressed, you can begin planning your wedding, corporate event, reunion, fundraiser, festival or seminar at SUN n’ FUN. We want to help bring your dream event to life! HOW MUCH DOES RENTING THE VENUE COST? Due to our price flexibility, we frequently work with every type of budget available – from Fortune 500 accounts to shoestring budgets. Once we know the details of the event, we can provide pricing, deposit and payment(s) requirements, etc. We want your event to be a success just as much as you do, so we will always find a way to make that happen. WHAT EVENT SERVICES SUN ‘n FUN CAN PROVIDE? When it comes to places to rent for events, SUN ‘n FUN provides you with the necessary tools to make your special occasion a wonderful experience. First, we offer you a professional event planner. In order to host the ultimate event, you need a professional event planner. 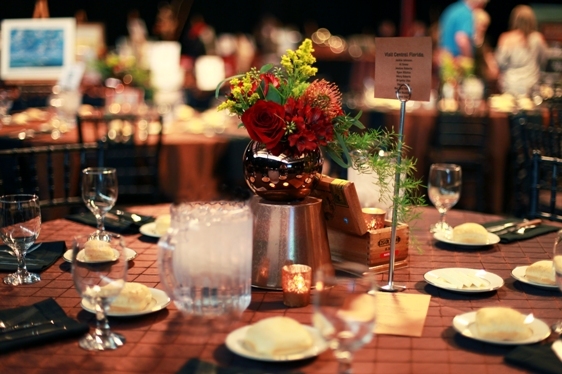 Our on-staff event planner is organized, detail-oriented, and extremely personable. It is our policy to deliver friendly, professional service with a can-do attitude to insure outstanding results for our clients. Our event planner will work with you. Though they will certainly offer suggestions or present you with choices in setting up the event, we understand this is your event. We know that teamwork creates the best outcome for a successful event. Our team will meet with you, review your desired decorations, and make your visions and ideas come to life before you know it! Our professional event planner can provide you a multitude of contacts such as bands, D.J.’s, photographers, caterers, linen rentals, decorators and the list goes on and on! Each of these are insured and happy to provide their portfolio and referrals. Whomever you choose will be a very knowledgeable professional. Dispensing of alcoholic beverages is permitted on SUN ‘n FUN grounds. However, if your party will be selling alcohol, you must use a licensed liquor provider. Are you limiting your guests to just beer and wine, or do you also plan to serve liquor? Preparing these answers in advance will not only save you time, but it will also help your licensed liquor provider do their job more swiftly and efficiently. We have many auto parking options available in many areas of the SUN ‘n FUN Expo Campus. We can park a few to literally thousands of cars if needed. All clean-up arrangements are unique and vary depending on the type of event; however, they all must be prearranged with SUN n’ FUN. We assume responsibility for mopping all floors and for the removal of SUN ‘n FUN equipment and décor. The client assumes responsibilities for clean-up and disposal of all event displays, confetti, ribbon, garland, banners and any other décor on the floors, walls or tables as well as any exterior décor. Rental companies assume responsibility for removal of tables, chairs and other rental equipment. Arrangements for tables, chairs and equipment must be pre-approved by SUN ‘n FUN. The client assumes responsibility for timely removal of non-SUN ‘n FUN equipment by 9:00 a.m. the day following the event. SUN n’ FUN provides the necessary amount of garbage cans and at least one 10-yard dumpster, as trash management is vital for any event. It is the responsibility of the client to remove trash and deposit it in the dumpster. SUN ‘n FUN’s dumpster must be able to close and it is the responsibility of the client to determine whether they will need additional dumpsters. Rented dumpsters left overnight on SUN ‘n FUN grounds will need to be covered or netted and cannot be left on SUN ‘n FUN grounds for more than two (2) days. WHAT ARE THE OPTIONS FOR GUEST ACCOMMODATIONS? When it comes to guest lodging for your event at our venue, we have a multitude of options. They may choose hotels, motels, vacation homes, RV Rental Companies, or even private house rentals. Please encourage all your guests to make reservations as soon as possible, as their preferred rooms and the best rates are only available for a limited time. Come see why SUN ‘n FUN remains one of the top-notch venues for events of all sizes! Please click here for more information on our guest accommodation choices. 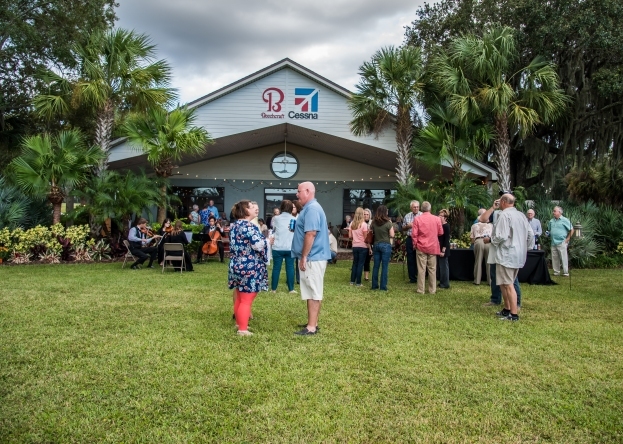 For more specific information on facility rentals or to book an event, please contact our Debi Hobbs, Events Logistics Manager at 863-904-4024.